ROADTRIP ALERT: 2012 to see two Frida Kahlo blockbusters within driving distance of Ottawa! Expect to hear lots about the late Mexican artist Frida Kahlo in coming months. Kahlo will be starring in two blockbuster exhibitions coming to Canada this year. This is, indeed, a rarity. 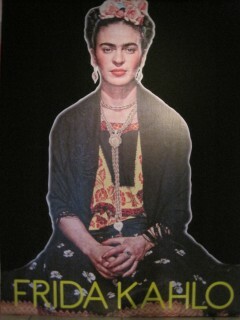 This Kahlo portrait has been turned into a poster to promote the Merida exhibitition. And to help get me (and you) in the mood for this unprecedented year of Kahlomania, I recently visited a Kahlo exhibition in the Yucatan city of Merida. More on that later. First some background. Kahlo’s paintings are constantly in demand around the world. Some of those paintings, such as the iconic Las Dos Fridas, rarely, if ever, travel outside Mexico. So, getting loans of just a few Kahlos is considered a major coup. Yet, Canada will be getting more than a dozen of her masterworks to savour. Check ads in local media in the coming months for transportation-hotel-museum travel packages from Ottawa to see the exhibitions. First up will be The Surrealist Adventures of Women Artists in Mexico and the United States, an exhibition running from June 7 to Sept. 3 at the Musée national des beaux-arts du Québec in Quebec City. The exhibition covers the period 1930 to 1970. Kahlo will, of course, get top billing. Then comes Frida & Diego: Passion, Politics and Painting, an exhibition at the Art Gallery of Ontario in Toronto from Oct. 20 to Jan. 20. Most of the 75 artworks in that exhibition come from the Musee Dolores Olmedo in Mexico City. The fabulously wealthy and devastatingly beautiful Olmedo was Diego Rivera’s greatest patron and, some say, his secret lover, which did not endear her to Kahlo, Rivera’s on-again-off-again wife. Nevertheless, the late Olmedo ended up with the largest collection of Kahlo’s paintings on earth. I have visited the Olmedo museum several times. It is a place that is the closest to heaven Kahlo fans can ever get. The Merida exhibition, simply called Frida Kahlo, is being held right in the centre of the city – the zocalo – in a building called Centro Cultural de Merida Olimpo. It is a small show touring around Mexico, courtesy of the state government of Tlaxacala. The state’s art museum in the city of Tlaxacala has several of Kahlo’s minor works, including very early drawings and paintings that can only hint at the superb, mainly self-portraits, to come. A giant poster on the exterior of the Centre Cultural de Merida Olimpo draws visitors. The best of the paintings in Merida from Tlaxcala is called Pancho Villa y La Adelita from 1927. The Spanish word “Adelita” is usually employed to describe a woman of courage, or even a fierce woman soldier. 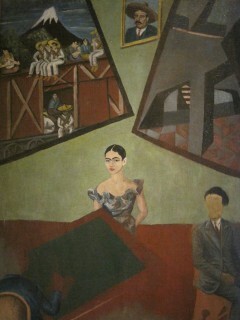 Kahlo, naturally, gives herself that role in the painting. The Kahlo drawings and paintings are vastly overshadowed in the exhibition by giant blow-ups of the artist’s many self-portraits. There is also a wall filled with photographs of the Casa Azul, the home in Mexico City where Kahlo was born and died. Merida is a city very close to some seaside communities, especially Progreso, popular with Canadian snowbirds spending the winter in beach condos. The Centre Cultural Olimpo must have been trying to get those snowbirds in a Kahlo mood before they fly home to see the blockbusters in Quebec City and Toronto. 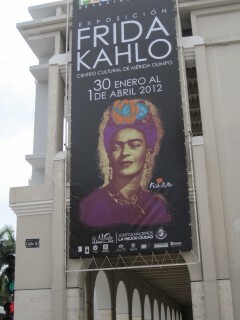 The Kahlo show is in Merida from Jan. 30 to April 1.